Working Sets are a powerful way of saving a group of Workspace items such as diagrams and matrices so they can be re-opened as a set at a later time. 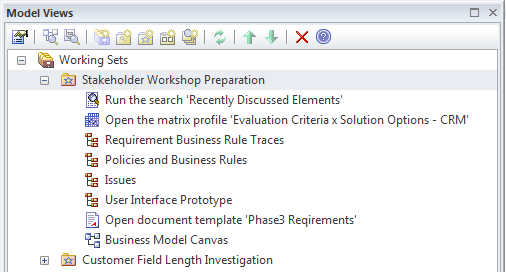 This allows a modeler to switch between multiple tasks without losing the context of the items they are working on. A Business Analyst will often work on a number of tasks simultaneously and each task will typically require the application of a number of techniques and tools including diagrams, matrices, documents and more. Working Sets allow a user to save groups of windows and diagrams they are working on as a set, giving the group a name so it can be easily recalled and the items opened as a set at a later time. Working Sets can be used to store a group of items open in an Enterprise Architect workspace as a set that can be reopened at a later time. A typical scenario is that a Business Analyst is working on a particular task and has a number of relevant diagrams and matrices and documents open that define parts of a problem or solution for a particular initiative. Suddenly they receive an urgent request to complete an unrelated task. They could save the open items as a Working Set so that once the urgent matter had been attended to the group of items could be easily reopened. Any number of each type of item can be added to a Working Set and the contents of the set can be edited and diagrams can be located in the Project Browser. 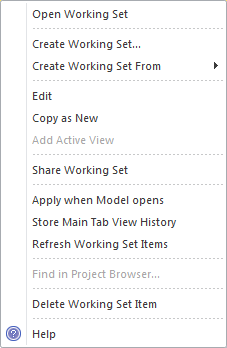 There are a range of options available from the Working Set name context menu including being able to make the working set available to other model users by choosing the Share option..